Unfortunately, they fail to recognize that not all spending is the same in this regard. That is, certain kinds of government spending are more effective as stimulus, e.g. investments in infrastructure, roads, airports, etc. This was what Keynes had in mind when he called for counter-cyclical fiscal policy to combat the Great Depression. At that time, the vast majority of government spending was either investment or consumption, with a relatively small share devoted to transfer payments such as retirement benefits. 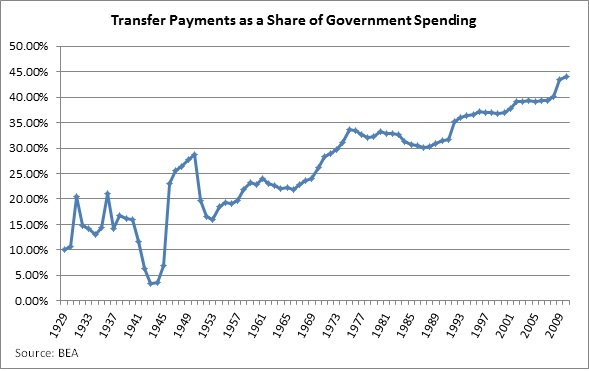 The following chart, based on BEA data, shows that in 1937, the year Keynes wrote the words above, transfer payments made up 14 percent of all government spending (federal, state, and local). Transfer payments have more than tripled since then to 44 percent in 2010, mainly as a result of the ballooning triumvirate of Social Security, Medicare, and Medicaid. Beginning in 1990, transfer payments step up with each recession, reflecting increasingly generous unemployment insurance compensation. This should be alarming to any self-respecting Keynesian, as well as anyone who likes economic growth, jobs, etc. For the most part, transfer payments amount to taking money away from working people and giving it to non-working people, i.e. paying people to not work. As such, whatever the merits of a social safety net, we should not be surprised to find the tradeoff is lower growth. It therefore stands to reason that cutting transfer payments may actually increase growth, and this is precisely what the IMF finds in their analysis of 170 cases of fiscal consolidation, i.e. periods of spending cuts and tax hikes, over the last 30 years. 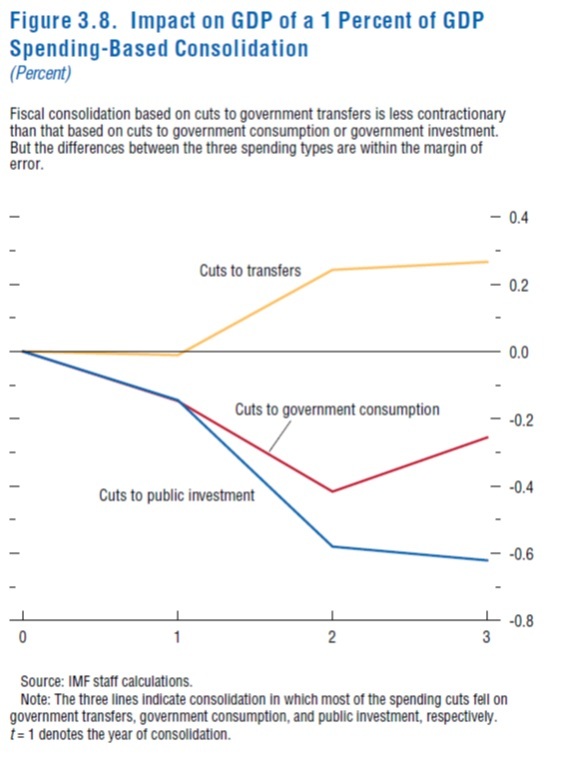 The following chart indicates that cuts to transfer payments have statistically zero effect on short term growth, and the point estimate indicates these cuts actually stimulate growth. Cuts to government consumption and investment produce the standard Keynesian result of lower short term growth. However, IMF simulations of the long term, i.e. when we’re all dead according to Keynes, indicate that debt reduction significantly increases growth — a 10 percentage point drop in debt-to-GDP raises output by 1.4 percent. 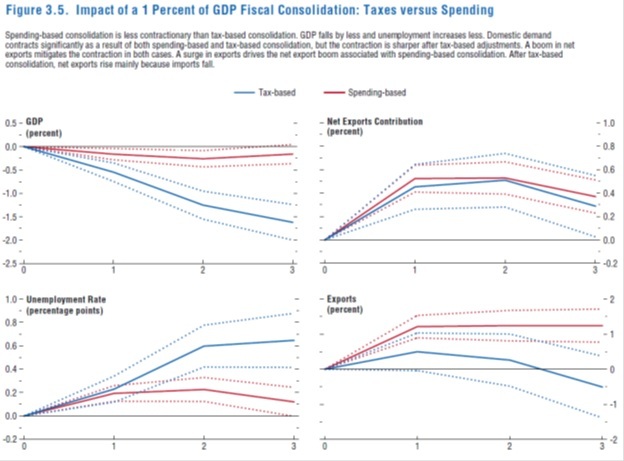 The main result of this IMF study, very much in line with other recent research, is that spending-based consolidations are less damaging to short term growth than are tax-based consolidations. In fact, as the following chart shows, they find spending cuts have no (statistically significant) effect on growth in the short term, whereas tax increases significantly and substantially reduce growth. In other words, smart countries, when faced with a debt crisis, cut spending and offset it with monetary stimulus. And the really smart ones focus spending cuts on transfer payments. This is the balance we should be seeking, as opposed to our current political “balance” between spending cuts and tax increases.